In recent years we have become increasingly attached to our phones as the number of features dramatically rises, allowing us to run large parts of our lives from these small devices. A growing number of college-aged students are also continuing to use their phone to text as they drift off to sleep and even in some cases text while they are asleep so don’t remember sending messages the following morning. So How Was The Study Conducted? A study was conducted by the Villanova University which involved 372 subjects from two universities. They were questioned about their nighttime mobile phone usage and habits. The study results revealed that over 25% of students claimed to text while sleeping with 72 per cent of these users also stating that they didn’t remember sending these messages in the morning. Although it sounds farfetched that many of us are texting in our sleep, it can be easily explained. The average person sends between 60 and 100 text messages per day, so this has become almost second nature. Sleep texters often wake up to text during the lighter phase of their sleep which means that often you don’t even have to wake up fully to send a response and it’s easy to fall back to sleep. The level of familiarity with texting is also why the majority of subjects in the study do not fall victim to sending embarrassing text messages even if they don’t remember sending messages. So how does this affect your sleep? Unfortunately, sleep texting can have adverse effects on your sleep quality. Sleep texting means that an individual sends a text message while still sleeping, but this also means that the user has been alerted when they receive a message. This alert wakes you out of a sleep cycle, and if this happens multiple times throughout the night, then this can affect not only the overall sleep quality but also the duration. The most significant cause of this is being so closely connected to our phones, and the best way to avoid this is by placing your phone out of arms reach from yourself when you go to sleep. We also recommended that you put your phone on complete silence or switch it off when you’re going to sleep. By even keeping it on vibrate this still has the potential to disturb your sleep. 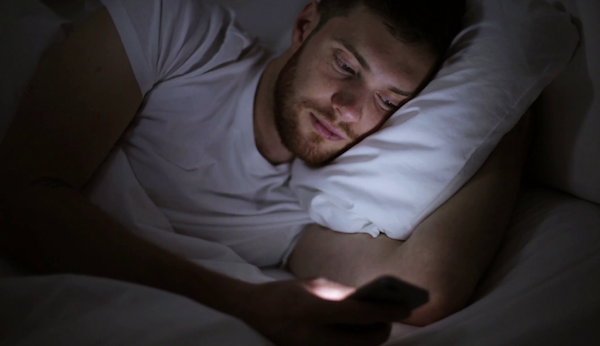 Tablets, mobile phones and other devices with screens emit a blue light which can inhibit the release of the natural hormone melatonin that gives you the feeling of tiredness. So if you find that you feel tired when you’re scrolling through your phone late at night, actually the opposite is happening, and this may make it harder for you to fall asleep. How Does Sleeping on a Sofa Affect the Body?